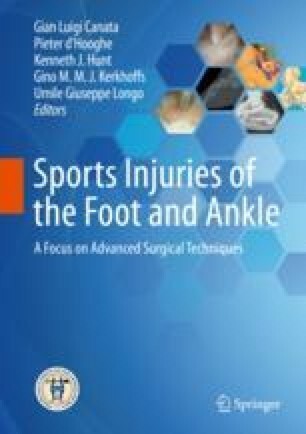 The majority of ankle sprains are caused by an inversion mechanism, which usually involves the lateral ligament complex. The most used classification incorporates anatomical damage with patient’s symptoms and grades the injuries from I to III. Generally, conservative management is preferred for the treatment of grade I and II ankle sprains to restore the mechanical joint stability through neuromuscular reprogramming, foot evertor muscles reinforcement, and muscular pre-activation. However, if the patient fails to respond to conservative management after 6 months, a surgical stabilization is required. The mini-invasive lateral reefing technique described in this chapter shows excellent results comparing favorably to other open or arthroscopic approaches.